At CPA Group, we commemorate and celebrate 10 year service for our security guards. 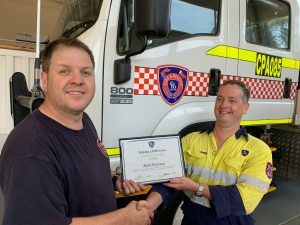 For the Fire & rescue team, we have not been operating quite 10 years as yet but we recently acknowledged the service of Mark Peterson who has worked with CPAFR since early (January) 2012 under the original CPAFR QGC contract. Mark’s Team Leader Tony Dell can be seen presenting a recognition award to Mark at Curragh. Team Leader Tony Dell (CPAFR), Greg Cox (CPA H&M), Ryan Gruel (CPAFR), Mark Petersen (CPAFR). 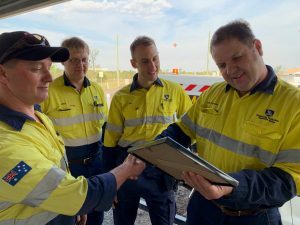 to Mark for “been instrumental in assisting in aligning all of the new crews in doing things the CPAFR way. Mark has gone over and above in completing his duties and stepped up as a team leader when required to ensure operations can continue”. Congratulations and thank you for all your hard work Mark!